What would be the easiest way to get a Leaf Stone in SoulSilver? I'm just about to enter Victory Road and need to evolve my Weepinbell. Should I go to the bug catching contest or the Pokeathlon dome or do I need to do something else? So the easiest way to get it would be the PokeGear Phonecall but you'd have to wait for that random call to happen and have the number of the person offering it. Since you're already at Victory road I assume you don't have the number so the bug catching contest is your best bet at this point. Or you can wait until Viridian forest and get it there. Oh I forgot to add, you can only get the Leaf stone post-National dex in the contest..sorry about that. Try to win the bug catching contest. Just catch a scyther or pinsir and you win. BUT keep winning until you get a leaf stone. Where can I get a leaf stone in SoulSilver? Where to find leaf stone in emerald ?!? Where do I find a Leaf Stone in Pokemon Black? Can I evolve my Eevee by Leaf Stone? 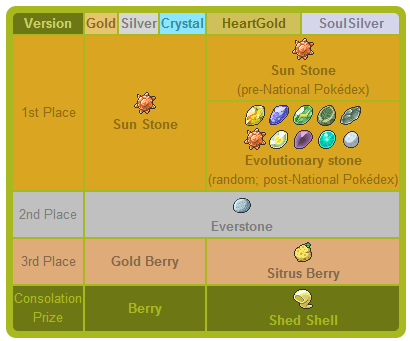 Where are the locations of Leaf Stones in heart gold? What is the easiest way to get a shiny Pokemon in soulsilver?